With winter really testing our muster (and patience) this cold February, we thought a hearty wholesome meal would help bring out our collective Minnesota heartiness. 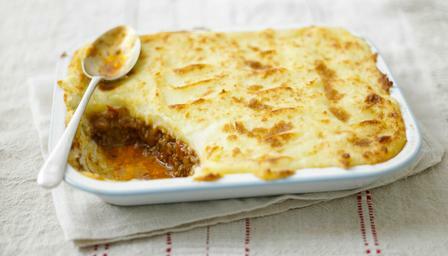 This Cottage Pie, sometimes called Shepherds’ pie, is full of healthy vegetables and meat, so it’s teeming with protein, vitamins and minerals. This recipe would also make a great freezer meal for the postpartum period– feel free to double or triple the recipe! We have had luck storing this meal in mason jars, to later thaw and add to a baking dish. You may choose to make the mashed “potato” topping when you are ready to heat and serve, or make ahead and just store it separately. Vegetarians, perhaps a meat substitute would work great in this recipe! Some ground tempeh might be really nice! 1. Heat 2 T of olive oil in a large skillet over medium heat. Saute the onions for 8-10 minutes. 2. Add the carrots and celery and saute for another 10 minutes. 3. Add ground beef and cook for 5-7 minutes until browned. 4. Add broth to the mixture and cook down until half of the liquid evaporates (about 7-8 minutes). 5. Stir in pepper and salt. 2. In a large glass baking dish (can use 8×8 or 9×13), add the meat and veggie mix. 3. Top with the mashed “potato” mix.